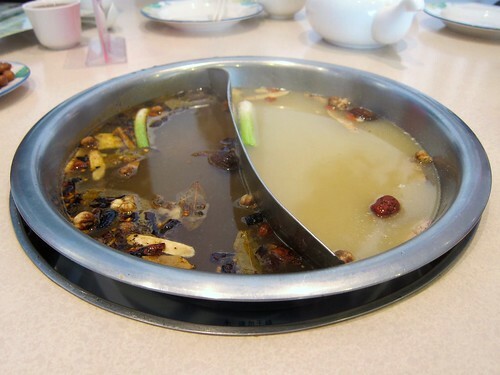 The chill in the air reminded my of an overdue post about a hot pot meal at Happy Sheep in Rowland Heights. Wandering Chopsticks had blogged about the Happy Sheep location in San Gabriel, and the owners wanted to thank her in some way. That way ended up being a (free) lunch for a group of her (mostly) blogger friends. Now, since it's been a while since this meal, I had forgotten all the prices. Luckily Wandering Chopsticks had blogged it, complete with all the price information, so I referred to her post for it. As this is a newer location, the decor and furniture are nicer than the other location. Their staple complimentary boiled peanuts. Most people that come here will probably get the spicy Mongolian broth, but I can't eat spicy. Luckily, these places let you split up the broth bowl with a metal divider. 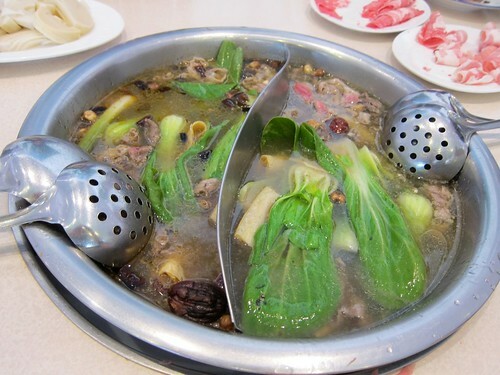 Call it "yin yang" hot pot. Our table ordered the "Nourish and tonic" and "Mongolian mildly spicy" (the hot pot costs $3.50 per person, plus the dishes you order). The first thing to get, of course, is the meat. 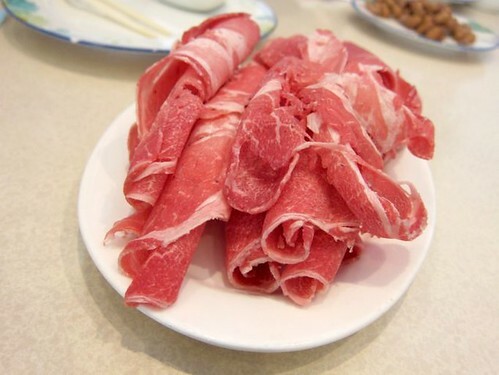 From your choice of beef, lamb, pork, and chicken, the meat dishes run around $4-4.75. 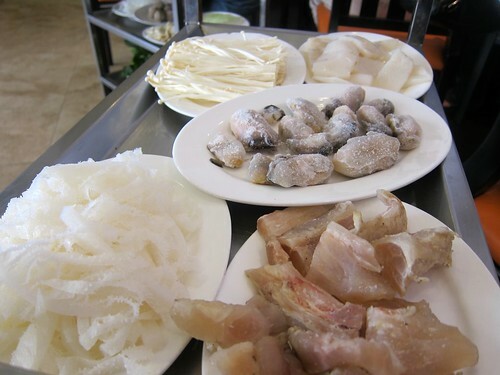 Tripe, tendon, oysters (frozen), and more. 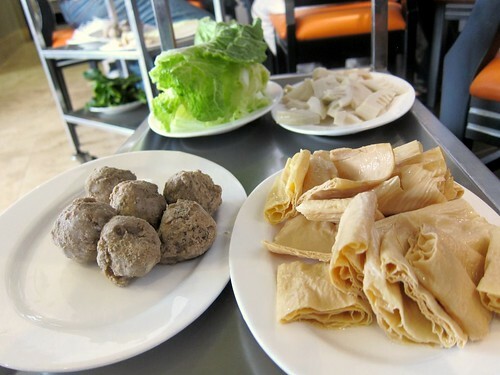 The one thing I really liked about this location was the variety and quality of non-hot-pot dishes which I didn't find at the other location. 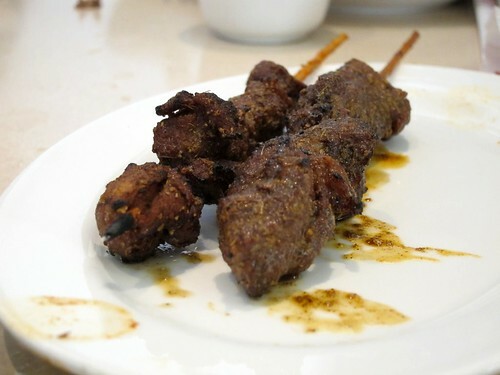 The lamb was pretty tender, and encased in wonderful spices. 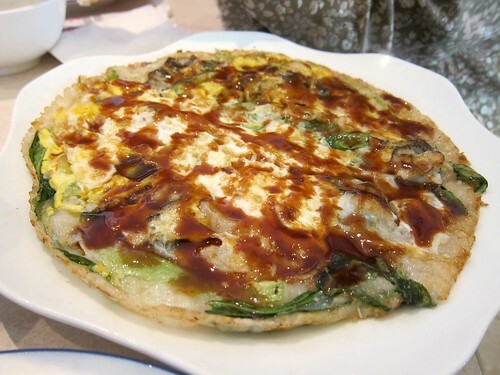 I originally thought that I didn't really like Taiwanese oyster omelette since I didn't like the one I had at Sinbala (I knew I loved the ones in Singapore though), but the oyster omelette here proved me wrong! 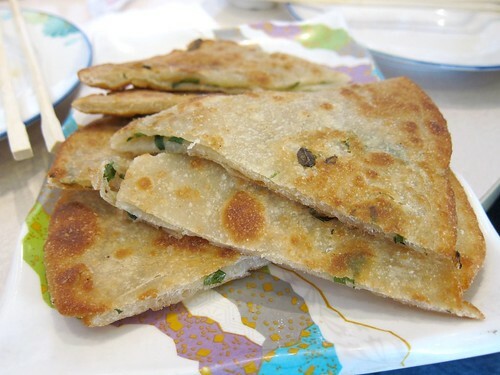 While the one at Sinbala was too gelatinous for my taste, this one was a denser, pancake-like version full of oysters. Texture and flavor-wise, it agreed with me much better. The House Noodle with lamb ($5.95) at first didn't seem that enticing to me, but we all ended up really enjoying it. 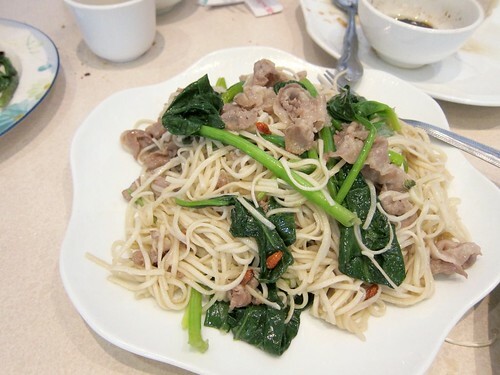 It looked like it would be bland, but both the thin noodles and the lamb had strong flavors. Hot pot and shabu shabu are perfect for a cold day. While Rowland Heights is a bit far for me, and I end up more at the Monterey Park location, I like the bigger selection available at this location. 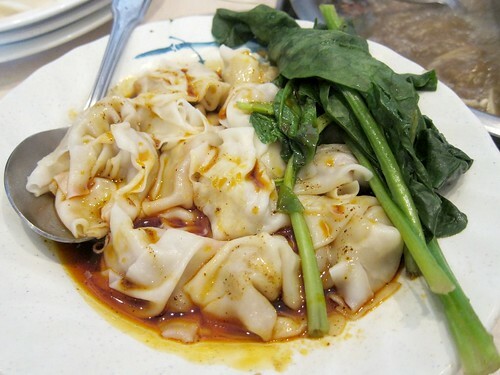 If you're in the area this winter, you should definitely stop by for hot pot and more! Disclaimer: This meal was free (hosted by the restaurant) to thank Wandering Chopsticks, but we each left $10 for our servers. The blatant trademark infringement by this restaurant is hilarious! "If you are looking for "Xiao Fei Yang" Flavor Mongolian Style Hotpot in Southern California (*More Info Later*) you're probably thinking about Happy Sheep"
Little Fat Sheep (xiao fei yang) opened about 5-6 months ago in Hacienda Heights. 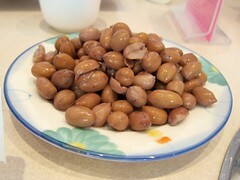 They are the original Xiao Fei Yang made popular in Asia. They had to go around with their attorney threatening law suits due to so many different restaurants using the same moniker/name and infrining upon their name. I find it hilarious that this restaurant is still trying to make money off of another business. Happy Sheep is good for hot pot as I've tried it before but the blatant infringement irks me. If you read Wandering Chopstick's post, you will get the whole story. Little Fat Sheep didn't *just open* 5-6 months ago. The Happy Sheep locations used to be Little Fat Sheep before they stopped the franchising and changed the names. The specific little fat sheep location he speaks of that is now called Hot Pot! Hot Pot! was told by the Little Fat Sheep company to stop the use of their name. They altered the english name but kept the chinese name. It wasn't into legal persuasion was used to have them change their name. From the information I was given, they were never affiliated with Little Fat Sheep and were trading on the goodwill of the original. 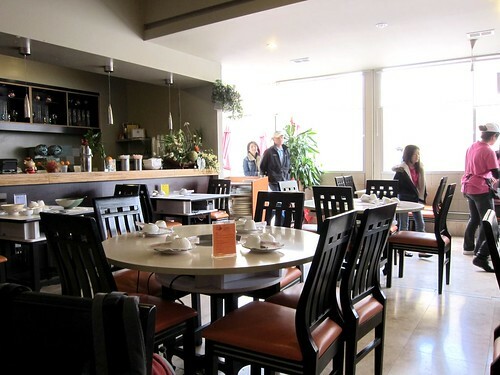 The hacienda heights location is the first one in Los Angeles. Every single little fat sheep on that page has the same logo and wording as each other. If you note the prior Little Fat Sheep off atlantic had a "similar" but not exact logo. Notice the sheep itself is different, not winking, different horns. If it was truly a franchise location they wouldn't alter the sheep to put a look a like. Feel free to email me, don't want to clog up your blog with this =) Otherwise love you pasadena recs! Thx for Luggage Room.. it's a staple on our rotation now! How interesting .. I have to admit I don't remember the sheep on the logo winking when I went to the one in Asia! nice. good to know. I actually found a green caterpillar in my usual hot pot place and was starting to grow bored of them so this sounds like a good change-up. do you know if they had that bland creamy sesame sauce on the table to dip stuff in? I love that stuff! Glutster: wait, you found an *actual caterpillar? That's rather scary! Btw are u talking about the sesame dipping sauce that they usually have in Japanese/ shabu places?